Comics have gotten simpler and, in many ways, dumber ever since. We no longer tell stories but tell fragments of stories. A story we once told in an issue takes three. Once, doing a two-part story required special permission, now the request is for story “arcs” because not many of us can actually tell a story anymore. This is a frustrating way to write, to not be able to give the audience a story but only a fraction of one part of the story, and then make them wait four weeks for the next piece. It would be different if we published weekly, say, a big block of paper with multiple serials running in it. But, last time I paid any attention to this, the art form of writing had been all but wiped off the written page in favor of beautiful pictures, 22 pages of awesome graphics that move the plot along at a snail’s pace. In the beginning, editors Joe Quesada, Jimmy Palmiotti and Nanci Dakesian carefully steered me away from the Marvel Universe. 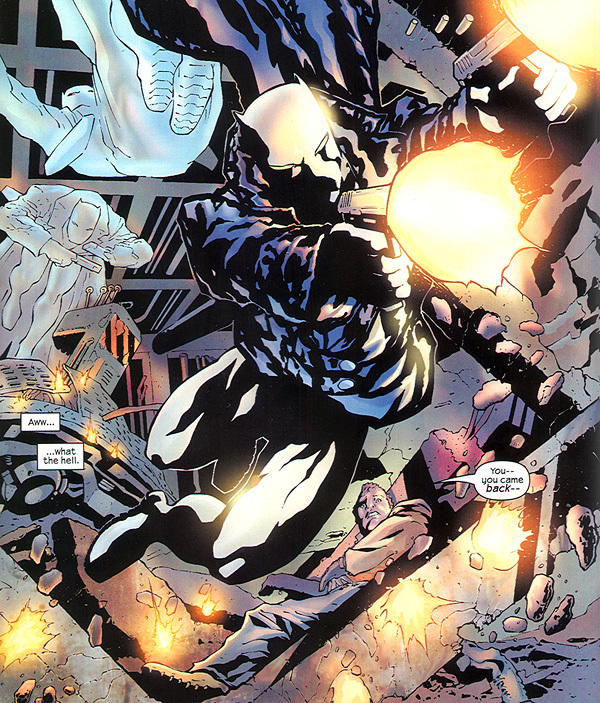 The Marvel Universe did not exist in Marvel Knights’ Black Panther other than to mock it. Those were not their words, but that was surely their sensibility. The Marvel U can drop in just as long as we insult the fans by having T’Challa punch out Mephisto soon as he encounters him. Joe, Jimmy and Nanci were perfectly content to have Panther exist in the Pantherverse and to not burden the series with too many channels to the mainstream. In hindsight, they were right. When new editor Axel Alonso brought in former BET president and feature film director Reginald Hudlin to reboot the series, they rightly cleared the decks of an unfathomable hairball of continuity. I love continuity, I love complexity. Neither worked very well with Sal’s classic, gorgeous art, which really deserved a lot more room than I gave him. I was also slavishly reverent of past writers Kirby and McGregor and resolutely determined to validate every inch of T’Challa’s previous continuity, which was fun for the fanboys but explaining all that stuff was like New Reader Repellent. I was incredibly frustrated to learn Marvel had no plans to repackage the remaining Panther issues, especially Enemy of The State II, Seduction Of The Innocent, Sturm Und Drang and other arcs, and spoke to Joe about it who said, rightly, that they were promoting a new Panther, now, ReggiePanther, and having that other stuff out there would split an audience they were trying to build. And, in a finger snap, my Panther ceased to exist, which, I suppose, it had to—I’d not left Marvel much alternative. But it was a big hit to take. Getting It Right:: Quesada/Palmiotti vision of Panther existing outside of the Marvel U. The other thing I wanted to mention is, at least back in those days, at Marvel, you worked for an editor. Now, some names are so huge they get to do whatever they want. But, traditionally, it is the editor who sets the creative direction for a series and who leads the creative team. I would routinely get lambasted online about whatever fans didn’t like about the series, but there seemed to be no allowance made for the fact that creative direction changes in the series tended to coincide with changes in the editor’s credit. 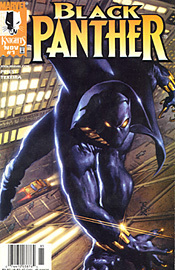 Mike Marts’ Panther differed from Tom Brevoort’s differed from Ruben Diaz’s differed from Joe and Jimmy’s. In retrospect, Joe and Jimmy’s Panther was the right Panther, which is likely why Axel and Reggie moved somewhat in that direction. There were simple lines, clean lines, in Quesada’s vision for the book. Whatever numbers it did were simply a consequence of the marketplace and the book finding an audience. Once Jimmy and Joe sent Panther back to the Marvel Universe, we began a five-year, relentless uphill turd roll trying to get the numbers to move. They never did. Black Panther will sell whatever it is Black Panther sells. Landing John Romita Jr. for ReggiePanther was a genius move (as was landing Hudlin himself, for whom Panther was and remains a labor of love). But, absent star power, Panther will do whatever numbers it does. We never should have gone chasing the numbers. Publish or cancel it, This Is What This Book Is. personality shifts, beginning with Ruben Diaz’s insistence we “mainstream” the title more, tossing in guest star after guest star and taking a fresh look at how Panther is seen by the Marvel U. Without changing continuity, we changed Panther’s motivations, which offended both the Avengers and the readers to some extent. Rather than mocking the Marvel U, Ruben loved poking it with a stick. A brilliant and underrated editor, Diaz and I had previously spent a year or so mocking the DC Universe with Justice League Task Force, a kind of JLA SEAL team whose premise was the JLA would send them on special assignments or to follow up after JLA engagements. Only, the JLA guys never once cooperated. They never sent the Task Force on any missions. So Ruben and I wrote, essentially, Kirby’s X-Men: young superheroes who get on each other’s nerves. Our unstated goal was to see how long we could get away with not actually giving the Task Force an official mission before somebody at DC noticed. They never did. Task Force’s numbers, while not spectacular, were more than enough to keep us going until the Grant Morrison JLA reboot. Tom Brevoort, whom I consider to be the best editor working in comics these days, was a much less angry young man than Ruben. Tom issued no mandates, was not heavy handed about Panther. Let Panther Be Panther, he said, that, essentially, the book was so closely connected to me that Tom was content to allow my personality to drive the creative direction. Under Tom, we were no longer poking the Marvel U with a stick but trying to integrate peacefully as a mainstream comic. In retrospect, this, too, was sort of wrong. Not that Panther should not interact w/the Marvel U, but I really needed pushback from the Marvel U to validate what I was doing in Panther. I mean, Panther annexed Canada and stole Stark Industries—a real center of national security concern—with a single phone call. Somebody, somewhere else in the Marvel U, should have noticed that. Panther revealed an unthinkable military capacity for Wakanda—and nobody else anywhere else in the Marvel U had even a single concern about it. Which, of course, was ridiculous. Panther’s relationship with the Avengers had grown contentious and they were (at least in Panther’s book) openly suspicious of him and his motives if not fearing outright for his sanity. But none of this was reflected back at us from mainstream Marvel books, many of which Tom oversaw. Trying to mainstream Panther was, at the end of the day, foolish because Panther was still The Other, existing in a parallel Marvel Universe when, to be true to continuity, by the time Panther revealed these massive mother ships that could wipe out entire continents, the Avengers should have said, “Okay, that’s enough—time to shut this guy down.” Instead, other writers ignored us, ignored the universe-spanning implications of what we were doing. Tiger Power:: Bennett gets Kasper right in The Crew. By the time Mike Marts inherited the book, we were under siege. It was all about the numbers. I was exhausted from trying to attract new readers and I felt like we’d been constantly chasing new readers at the expense of the loyal ones we already had. I felt like going after new readers was a waste of time: people knew what this book was, had read the reviews, knew my name, knew who Sal and Bob were. They either bought it or didn’t. But we were tasked, repeatedly, to stunt-up the book with “jumping on” points. The problem is, convenient jumping-on points are also convenient jumping-off points. There was no traction, and Mike and I discussed this at length, concluding the only way to jazz up Panther would be to separate Panther from me. It wasn’t Panther per se the reader were giving a pass to, it was likely the convolution of plotlines and density. With my knowledge, Mike started shopping for writers. A decision was made, I’m not sure by whom, to try something else: revamping the character altogether and losing the West Wing-style superhero politics, which required complexity and perhaps too much investment from the readers. I believe that was their pitch to the prospective writers: come up with a new, hip-hop relevant Panther. Remove T’Challa, put him on a bus or what have you, and wheel in the new guy. For whatever reason, the selection choice turned back to me. I wasn’t overly thrilled about the idea, but I thought I might have a way to go. Blending the dynamics of Stan’s early Spider-Man, I created a new character who finds one of Panther’s old costumes left in an alley. Dan Fraga was brought in for the art and Andy Kubert was put on covers. We were given, I believe, a year to make Kasper Panther work, but he never caught on. The book still had my name on it, and the change may have come across as a desperate move on my part to keep my job at the expense of T’Challa’s rich legacy. Also, Dan Fraga departed after a single issue, and Kasper Panther suffered tremendously over the miscasting of a Brazilian (I believe) artist who, while a fine draftsman, was completely clueless about hip-hop, black people, or, say, Brooklyn. 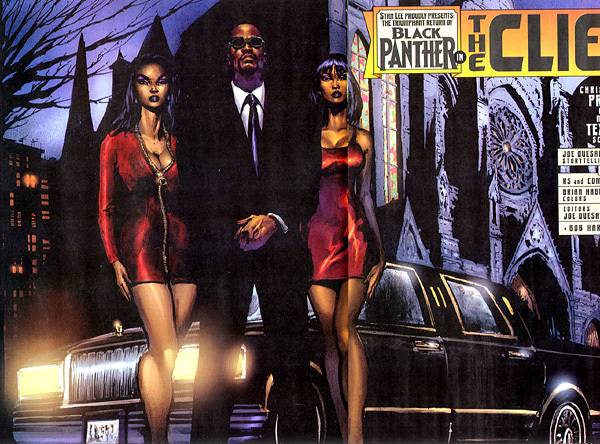 Kasper Panther, which was supposed to be an edgy, hip-hop thing, looked like it was being drawn by Sal Buscema. Sal is a brilliant artist, but he would not have been my first choice for a comic book that was supposed to resonate with Vibe Magazine or XXL. I struggled and over-wrote to compensate, trying to get the words to do what the pictures abysmally failed to, but from my desk, Marvel had given up on Panther and was just running out the clock. The first time Kasper Panther ever breathed real life was when artist Joe Bennett electrified the concept over in The Crew. I remember seeing Bennett’s first pages with Kasper, thinking, “This is what Mike (Marts) asked me to do in the first place.” Bennett, also no hip-hopper, was nonetheless ingeniously intuitive. Despite the language barrier (Joe was from Spain, I believe), Bennett brought the Crew scripts to life with verve and energy sorely lacking from the Kasper Panther issues. I was chatting with Reginald Hudlin last month and told him I’d only read, I believe, the first issue of his Black Panther. It wasn’t that I resented him in any way or that I was jealous or angry. Axel and Reggie did what needed to be done and did so brilliantly. I don’t go to comics shops and I’ve been way out of the loop about what’s been going on, but, from what I can tell, Panther has enjoyed several iterations beyond Hudlin's and has found more acceptance and popularity (if nit quite outright stardom) in the Marvel Universe than ever before. This is heartening, and I will take some credit, along with Stan and Don, for whatever part my creative contributions played. The Black Panther Copyright © 2011 Marvel Productions. All Rights Reserved. became this really fun, really enormous caper, with Stark and T'Challa battling one another physically, politically and economically, pulling the rug form under one another at every turn, outwitting and out-foxing each other and being outfoxed by the likes of Happy Pants Panther (who schnooks the real Panther and takes his place in the final chapter), and a Frogged Tony (who steals the real Tony's Stealth Armor in an attempt to kill Panther). 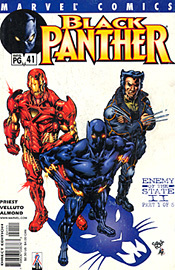 It was a great mess that made absolutely no sense until all the pieces came together in issue #44, with Happy Pants Panther and the Kirby Crew bringing their storyline into Tony Stark's office, interrupting the more sober and straightforward Tony versus T'Challa storyline, and bringing King Solomon's two brass frogs together for the finale— which stretched to another issue, making a record five months of active duty in PANTHER for Iron Man, but one well worth the effort. 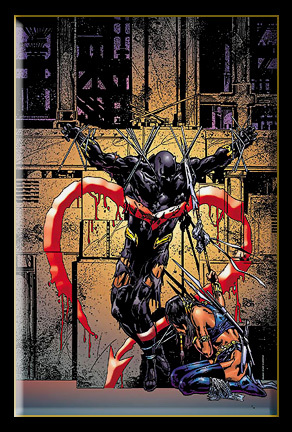 Enemy 2, likely, would read better as a trade paperback, but the likelihood of more trades featuring the Marvel Knights version of Black Panther is way up in the air, to my great irritation. Sturm Und Drang, Seduction of the Innocent, and, surely, Enemy 2 would make better trades, I think, than they made comics, as the reader would no longer have to wait four weeks to resume the complex and layered stories. These arcs were PANTHER and Sal and Bob at their Sal and Bobbest, and I am deeply disappointed that Marvel is kind of waiting to see what they'll do. The logic is reasonable: we are moving on to a new evolution in the PANTHER series. If there's to be a trade, it would make more economic sense to support the current incarnation of BLACK PANTHER, not the previous one. I can't argue with that logic, but emotionally, I'm disappointed that our best work on this series may not have the opportunity to be presented in a format that maximizes the best things about it: its density and complexity. CBy this time I was deeply depressed over the impending change in direction the series would undertake. Nobody held a gun to my head and made me change the book, but it was obvious PANTHER would keep reeling from bad to worse to inevitable cancellation unless we took some chances and tried some new things. The newest and likeliest thing was a change in creative teams and, for awhile, it looked like all of us— myself included— would be moving on. But it was ultimately decided that the few fans who do read PANTHER read it as much for what I am doing as for the character, so I was asked to find some new expression of the concept that might spike interest in the book and maximize Panther's new exposure in THE AVENGERS. Learning that I would have to move on without Sal and Bob sent me spiraling into depression, a dark mood that became the visual style of Sal and Bob's finest work on the series, The Death of The Black Panther. I'm not quite sure why Sal is not the highest paid artist in comics, or why his work had not yet reached the fan-fave status a draftsman of his powers deserves. It could be that I am old, an ancient 41 at this writing, and my appreciation of draftsmanship is based on guys who can actually draw, the Stan Drakes and Neal Adams and Nick Cardys, Joe Aparo, Alan Weiss, Curt Swan (and Murphy Anderson!!! ), and so forth. These are names many contemporary comics fans have only a vague notion of, but these men were master craftsmen in the classic style, much as Sal is. Sal is not a Manga Guy or an Image Guy or a flashy guy or a style guy. No giant feet and mouths stretched three feet wide. No giant breasts and tiny waists. when I ask Sal to draw a bus, I get a bus, not a matchbox with wheels on it. Write this down someplace: this man can draw. And, not only could he draw, but Sal and Bob were fanatically involved with this project. Now, maybe that wasn't enough to put us across the goal line in sales, but it should have been enough to trouble us to find a way to make them work.